On Monday, March 18, Barnard hosted its fifth annual Global Symposium, Women Changing Brazil, in São Paulo. 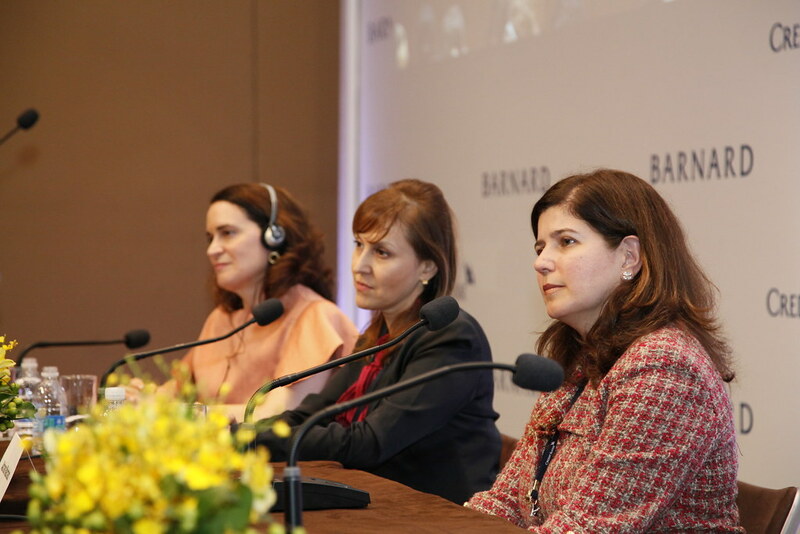 Approximately 400 people attended the day-long event at the Grand Hyatt São Paulo, which brought together exceptional leaders from all over the country as well as Barnard students, alumnae and faculty for wide-ranging discussions addressing education, activism, leadership, science, the arts, public policy, government, work-life balance, and violence against women. The free event was open to the public and sponsored exclusively by Credit Suisse. Read more and view photos and video highlights. The symposium opened with introductory remarks from Michelle Gadsden-Williams, managing director and global head of diversity and inclusion at Credit Suisse, and Barnard alumna Petra Costa ’06, a Brazilian filmmaker and actress. Debora Spar, president of Barnard College, also spoke, noting the significance of holding this year's symposium in Brazil. The keynote address was delivered by Eleonora Menicucci, Brazil’s Minister of the Secretariat of Policies for Women. Minister Menicucci is among President Dilma Rousseff’s record number of 10 female ministers in Brazil’s cabinet. Here, she tells a story of how President Rousseff's presidency is inspiring young girls in Brazil. The first panel of the day, “Voices of the Region,” showcased women whose art and activism are effecting change and improving conditions in Brazil for the greater good. Speakers included Panmela Castro, graffiti artist and activist who uses street art to promote the rights of women; Kátia Lund, screenwriter and film director of City of God, whose organization Nós do Cinema (We of Cinema) provides training and job opportunities to poor children in Brazil’s favelas; Mayra Avellar Neves, student activist and winner of the 2008 International Children’s Peace Prize who mobilized a peaceful protest in her drug- and violence-plagued community to demand a cease-fire during the hours when children walk to and from school; and moderator Kathryn Kolbert, director of Barnard’s Athena Center for Leadership Studies. Here, Castro reflects on the difference between legal equality and social equality. After a lunch where participants mingled and chatted in both Portuguese and English about the events of the first half of the day, Monica Waldvogel, Globonews journalist and news anchor, moderated a discussion of women in science in Brazil with Duilia de Mello, NASA astronomer and professor of astrophysics at The Catholic University of America, and Mayana Zatz, a professor of human and medical genetics at the University of São Paulo who has been actively involved in genome research related to the passage of the Brazilian embryonic stem-cell bill in 2005 and 2008. Here, they debate whether genetics influences interest in science among women. The day culminated with “Conversations on Leadership,” which was moderated by Spar and included Adriana Machado, the first woman to serve as president and CEO of GE Brazil, and Maria Christina Frias, member of the board and columnist for Folha de S.Paulo. Here, Spar talks about the distinction between ambition and competition among women. The Global Symposia series, held previously in Beijing in 2009, Dubai in 2010, Johannesburg in 2011, and Mumbai in 2012, provides a dynamic forum for discussion of women's issues, to create a network of women leaders from around the world, to inspire young women about their own leadership potential, and to provide an opportunity for Barnard, as an American college, to learn from women in other parts of the world. This year's Young Women's Leadership Workshop took place at Graded, the American School of São Paulo. Attended by more than 60 high school girls from five schools around the city, the event included a talk by Barnard's Dean of Enrollment Jennifer Fondiller, as well as an overview on women's leadership by Prof. Kathryn Kolbert, the Constance Hess Williams director of the Athena Center for Leadership Studies. From there, the students were divided into groups for the workshop sessions designed and facilitated by Barnard's Global Symposium Student Fellows.